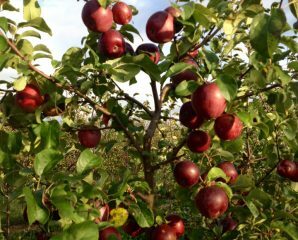 News from Watertown – Home orchards are on the rise and we are ready! Our field grown apple and pear trees from our fields are dug and in our sales yards! They produced fruit last fall, so expect a bountiful crop this year too! Check out our varieties – there’s a flavor for everyone. Fuji – mild sweet flavor, dense flesh is perfect for fresh eating and baking. It ripens very late and stores well for 3+ months. It is semi-dwarf. Jonagold- sweet yet tart delicious apple used for fresh eating, cooking, juicing & making hard cider. It ripens late and stores well for 1-2 months. It is semi-dwarf. Liberty- crisp, juicy and sweet like a McCintosh, but more tart in flavor. Used for fresh eating, juicing and apple sauce. It ripens late and stores well for 1-2 months. Has exceptional disease resistance. Macoun – sweet, juicy apple best eaten fresh off the tree since its storage life is short. Also good for cooking, canning and drying. It ripens late and is semi-dwarf. Royal Gala – is a heavy producer that ripen late summer. Look forward to crisp, sweet fruit! It is a dwarf and a mid-season bloomer. Bartlett – sweet, juicy pear used for fresh eating, salads and desserts. Ripens in late August. Use ‘Moonglow’ as a pollinator. Shinseiki – sweet, juicy and crisp like an apple. Used for salads and fresh eating. It is self-fertile. It produces a heavy crop at a young age on a vigorous plant. It ripens in August. CHERRIES- Rynbrandt (7 gal. ), White-Gold. Plant in full sun with well drained soil that is rich in organic matter. Prune apples and pears late winter to open the tree canopy allowing light and air circulation, encourage vigorous new growth and bring down the height. Cherries should be pruned in the summer when the weather is hot. Peaches can be pruned late winter/early spring. Apples- all listed need a pollinator except golden delicious. Pears- Bartlett and Moonglow will pollinate each other. Shinseiki is self-fruitful. Cherries- White gold is self-fruitful, Rynbrandt needs a pollinator. Plums- Stanley is self-fruitful, Superior needs a pollinator.